Over 150 movers, shakers and regular folks packed the upstairs bar at Harry Browne’s across from the State House Tuesday night raising close to $30,000 to support MarylandReporter.com, the nonprofit news website about state government and politics. Guest bartenders for the event were Gov. Larry Hogan and Comptroller Peter Franchot. In the only brief speech, founding editor Len Lazarick thanked the sponsors and guests for supporting the news operation. 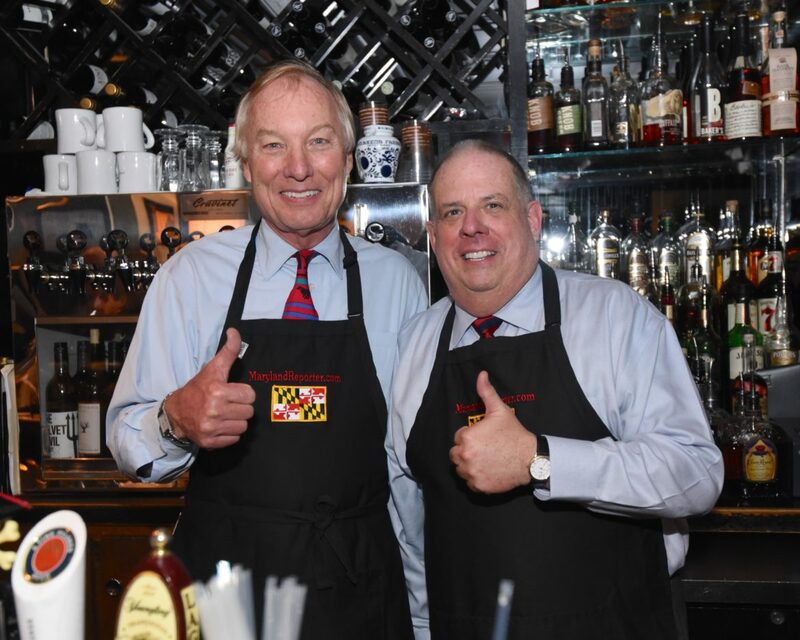 When Comptroller Franchot reminded him to thank the bartenders, Lazarick said that whatever else the governor might do, he was a great bartender, as he was for last year’s event. Hogan shot back that he ought to tell that to Barry Rascovar, the columnist who is a persistent critic of the governor. Despite the presence of the chief tax collector behind the bar, Franchot was not able to waive the 9% alcohol tax on the hefty bar tab, one of the many tax hikes by his predecessor Hogan campaigned against. Here is a gallery of photos from the event and below it is a list sponsors and donors. Joanne and Michael Davis with the governor. Governor's Office photo. Christopher Summers of the Maryland Public Policy Institute and lobbyist Gerry Evans. Bob Costa photo. The governor with Bill Castelli of the Maryland Association of Realtors and Bob Johnston of the Anne Arundel County Assoc. of Realtors. The governor is introduced to Kevin Ward by his wife Rachel Lazarick-Ward as Maureen Kelley looks on. Governor's Office Photo.